Mouse anti Human MALT1 antibody, clone 50 recognizes human mucosal-associated lymphoid tissue lymphoma translocation 1 (MALT1), also known as MALT lymphoma-associated translocation and paracaspase. MALT1 is an 824 amino acid ~93 kDa protein belonging to the peptidase C14B family containing a single death domain and two Ig-like CD-type domains. In normal lymphocytes, MALT1 plays an important role in antigen receptor-mediated lymphocyte activation. In T-cells, MALT1 is recruited by activated CARMA1, along with Bcl-10, to form a CARMA1-Bcl10-MALT1 (CBM) complex which is involved in the activation of NF-kappaB (Yang et al. 2013). Mouse anti Human MALT1 recognizes both MALT1 and the MALT1-API2 fusion protein (Murga Penas et al. 2007). Recombinant protein corresponding to amino acids 701-808 located within the C-terminal of MALT1. Ye, H. et al. 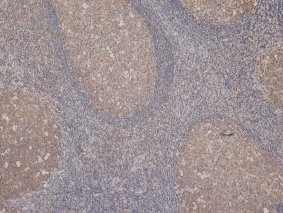 (2005) MALT lymphoma with t(14;18)(q32;q21)/IGH-MALT1 is characterized by strong cytoplasmic MALT1 and BCL10 expression. J Pathol. 205 (3): 293-301. Coornaert, B. et al. (2008) T cell antigen receptor stimulation induces MALT1 paracaspase-mediated cleavage of the NF-kappaB inhibitor A20. Nat Immunol. 9 (3): 263-71. Rebeaud, F. et al. (2008) The proteolytic activity of the paracaspase MALT1 is key in T cell activation. Nat Immunol. 9 (3): 272-81.